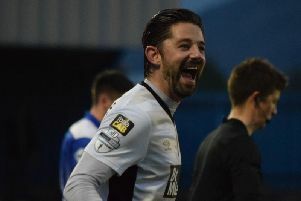 Kevin Braniff put in a man-of-the-match performance to earn all three points in their grudge match with Dunganon Swifts. The Swifts won an ill-tempered affair when the two teams last met, which ended in a brawl after the final whistle. But there was none of the same ugly scenes this time around as Glenavon bossed the Mid-Ulster clash. Dungannon took the lead when Swifts captain Ryan Harpur slid a Matt Hazley cross under James McGrath after Jamie Douglas and Jamie Glackin combined in the best move of the match. It was the 10th time the Swifts have taken the lead against the Lurgan Blues in a row. But Glenavon also have a knack of scoring in this fixture and equalised when Marshall headed in a Neill corner. Glenavon took the lead when on 51 minutes when Declan O’Brien chested the ball down for Braniff, who moved onto the edge of the box and curled a wonderfully taken shot past Andy Coleman with his right foot. There was a sour note when Cameron Grieve had to be stretched off after blocking a Ciaran Caldwell shot on 90 minutes. And then referee Keith Kennedy appeared to point to the spot after Eoin Bradley was brought down on the edge of the box, only to change his mind and award a free kick which sub Gary Hamilton put high and wide with the last kick of the ball. GLENAVON: McGrath, Neill, Murphy, Dillon, Caldwell, O’Brien, Marshall, Braniff, McCabe, Martyn, Singleton. Subs: Lindsay, Kilmartin (Martyn 71), Hamilton (Neill 89), Bradley (O’Brien 73), Patton. DUNGANNON SWIFTS: Coleman, Lowe, Wilson, Burns, Grieve, Mitchell, Glackin, Hutchinson, Douglas, Hazley, Harpur. Subs: Liggett (Hazley 65), McCullough (Hutchinson 81) Armstrong, Lavery (Douglas 65), Sanusi.